As I illustrated in this screencast on the readability bookmarklet (a new version was released yesterday), I like to read content on the web, not advertising. 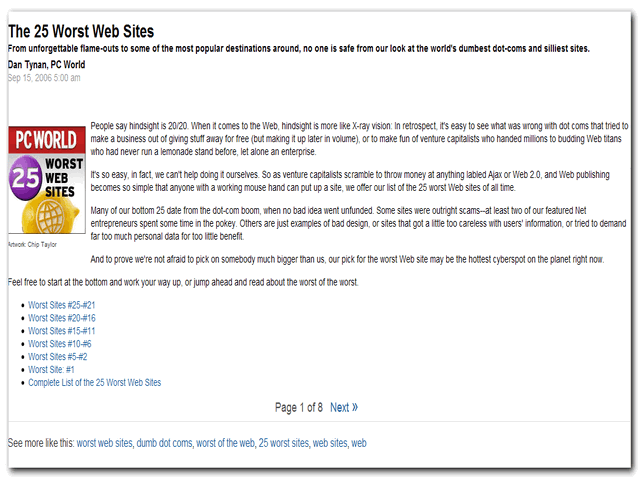 Here are some other tips to make reading on the web easier when ads overrun the site or articles are split up into a ton of separate pages. 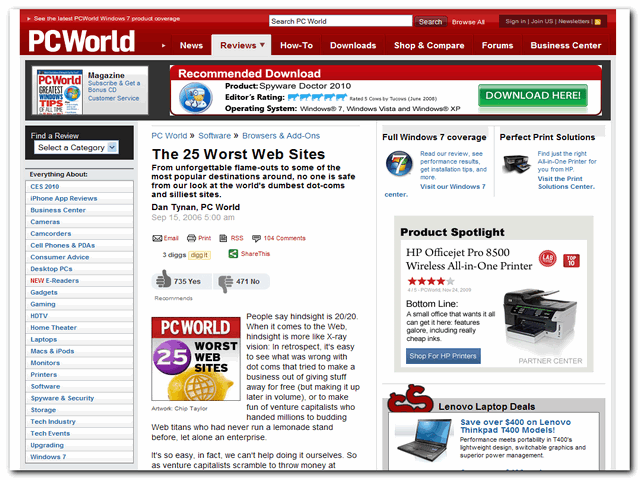 Our test site is PC World’s The 25 Worst Web Sites. 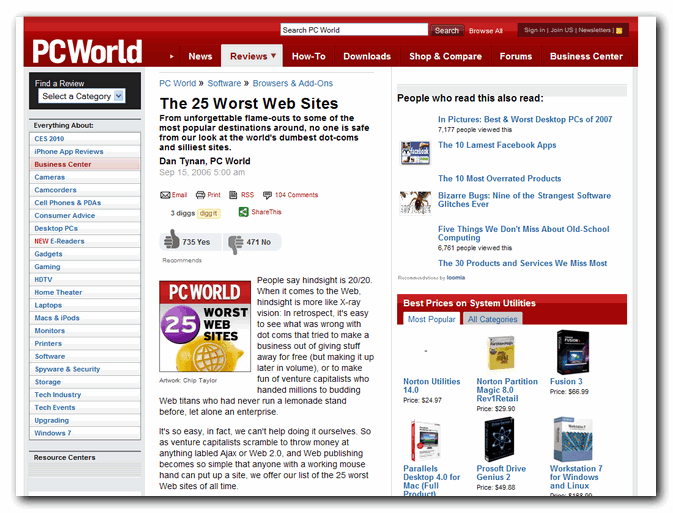 Clocking in at 8 pages, one could argue PC World is vying for the 26th spot. Here it is, in all its ad-filled glory. First off, if you don’t use AdBlock already, get it now. It will completely change (for the better) your browsing. Notice how much more content you can see without ads getting in the way. This works more often than not. Look for a link that says Print or Print this, or even an icon of a printer. Click it to read the complete article without ads or broken up into pages. You’ll sometimes have to cancel the print dialog. 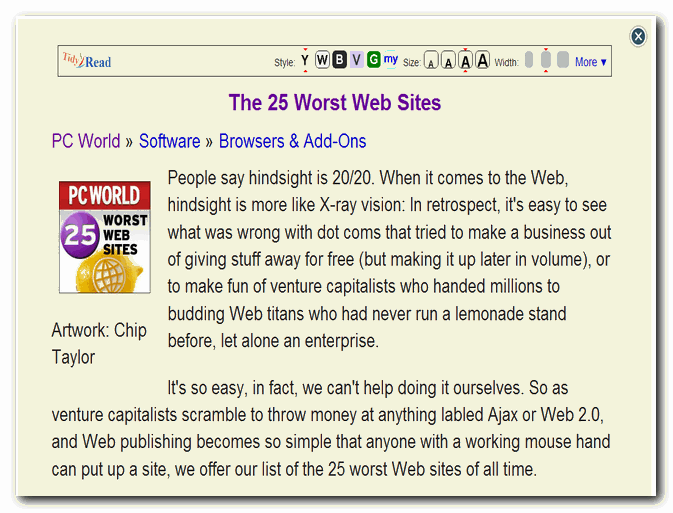 TidyRead has a Firefox extension and a bookmarklet. What you see above is the bookmarklet version. This isn’t as fast as the other options, but the results are great. Using the PrintWhatYouLike Bookmarklet you can manually remove elements on the page. The easiest way is usually to isolate the content rather than removing everything around it. It’s intended for printing so you can save your precious ink, but it works reasonably well for online viewing.